First of all, the story of Noah was not originally a Christian story. It belongs to Jewish tradition, which we as Christians, later adopted. Some might say it would be best to hear comments from a Jewish perspective about the movie, rather than listen only to outspoken pious Christians who are opposed to the movie because it shows more than just what is in bible. This makes a good point. What does the movie add to what is said in the bible? First, it is important to note that the story stems from the Jewish tradition of Midrash. Midrash is when a deeper story is used to explain a bible story by filling in the gaps of the bible version. Note however, that these “embellishments” are not widely considered biblical truths: Midrash simply helps one to understand the bible story. .
Secondly, a few words about Noah as he appears in the movie: He is not presented as a holy, handsome, nice guy who follows God’s will. We find him in the movie portrayed as a real man, with a love for God but clearly with his own human weaknesses. 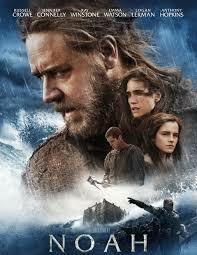 Noah’s image as presented in the movie should cause every man to take notice. Why? When Noah didn’t know what the future held, he simply came up with his own idea about the flood- specifically that God would let all humans die and then it will be all over… THE END. Noah clearly was not thinking rationally. Apparently, Noah was not familiar with the Jesuit concept of discernment: He almost killed his two granddaughters and almost lost his whole family, all the while believing that he was doing God’s will. Fortunately, love was stronger than His need for “justice”. What shouted loudest at me was the scene when Noah runs to rescue his son and seems to ignore the girl his son recently met, the girl who could later become his wife. Everything Noah does, he does in complete blindness and total obedience to his own thinking and for his own reasons. This scene is a particular strong warning for me, especially as it demonstrates just how easily we can deeply hurt the most important people in our life. How often do you dear fathers, not listen closely to your son or daughter’s dreams and desires? How often do you dear parents, try to mold your children’s lives in a certain way, a way that you think is the right way? How often do your children feel rejected, despised, or simply not understood, at least in part, because of the way you treat them? Noah lost his son Ham. You too can lose your children by doing for them what only you define as “being the best”. Sadly, I know how that feels…. and probably many of you know just as well. Overall, as for this movie, which incidentally was made by an atheist, I rate it very highly. This entry was posted in Church Today, Men's corner. Bookmark the permalink. ← Fr Jim homily. Signs and blind men. 4 Sunday of Lent.